There are several distinct types of blueberries with many cultivars and varieties derived from each of those. As a result, blueberries can be grown in all but the severest climates. The plants themselves are attractive enough to use in landscaping, especially as background plantings or hedges. Keep in mind that some varieties can grow as tall as ten feet. The foliage turns a wonderful shade of red in autumn. Blueberries begin blooming in early to mid spring. The white flowers are produced in clusters on the tips and along second year canes. The blossoms look like little bells that somewhat resemble lily of the valley. Set out young plants in late April or early May in a sunny location. 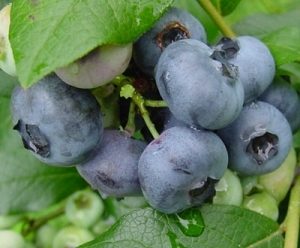 Blueberries will grow in partial shade, but flower and fruit production will suffer. Plants should be spaced 5 to 6 feet apart, with the exception of lowbush varieties which should be set one to three feet apart in rows three to four feet distant. Heavy mulching up to 4 inches deep with sawdust, peat moss or chopped straw is beneficial to the plants by maintaining even soil moisture and temperature. Generous mulching should be maintained for the life of the plants as it will help enrich the soil and protect their shallow root system. Blueberries are always thirsty. Give enough water to keep the soil moist at all times and use a fertilizer specially formulated for blueberries. These are the large (up to 1 inch diameter) berries usually found at the grocery store. The plants can attain heights of six feet and more and are widely grown from Zones 4 through 11. Also known as 'wild blueberries', the plants average 18 inches tall. Plantings will propagate themselves by sending up shoots from underground runners, eventually forming a dense groundcover. When planting, cover about one third of the top stems with soil to encourage runners. The small quarter inch fruit is very sweet. Plants prefer the cooler climates of Zones 3 to 6. This is a popular hybrid between lowbush and highbush blueberries. Plants are from 3 to 5 feet tall and adapt well to the colder climates including the harsh winter conditions of Zone 3. This is a species native to the Southeastern United States which can grow up to 10 feet in height. A good choice for the hot summer climates in zones 7 through 9. No matter where you live or which varieties you plant, blueberries are a valuable and delicious addition to any home garden, provided you can beat the critters to the harvest.